Customize your eCommerce store with official extensions for WooCommerce. Looking for a theme for your WooCommerce store? 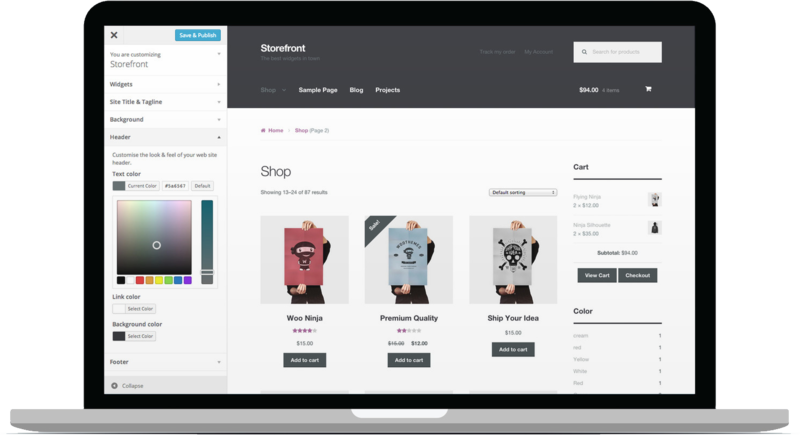 Check out Storefront, a free WooCommerce theme with deep integration. PayPal Checkout now with Smart Payment Buttons™, dynamically displays, PayPal, Venmo, PayPal Credit, or other local payment options in a single stack giving customers the choice to pay with their preferred option. Grow your sales on Google Shopping in a few simple steps with Google Ads for WooCommerce, the official Google Ads extension for your store. Allow customers to book appointments, make reservations or rent equipment without leaving your site. Give members access to restricted content or products, for a fee or for free. Let customers subscribe to your products or services and pay on a weekly, monthly or annual basis. Offer add-ons like gift wrapping, special messages or other special options for your products. Take credit card payments direct on your checkout using the Authorize.net (AIM) payment gateway for WooCommerce. Offer customizable bundles and assembled products. Automate your store with more than 1000+ cloud services to save time and increase productivity. Optimize your checkout process by adding, removing or editing fields to suit your needs. Add shipment tracking information to your orders. Advanced, flexible shipping. Define multiple shipping rates based on location, price, weight, shipping class or item count. Create and offer product kits with configurable components. Accept Visa, MasterCard, American Express, Discover, JCB, and Diners Club cards directly on your store. Get the Official Facebook for WooCommerce plugin for two powerful ways to help grow your business. Amazon Pay is embedded in your WooCommerce store. Transactions take place via Amazon widgets, so the buyer never leaves your site. Understand your customers and increase revenue with world’s leading analytics platform – integrated with WooCommerce for free. Accepting payments is easy with Square. Clear rates, fast deposits (1-2 business days). Sell online and in person, and sync all payments, items and inventory. Fulfill all your Woo orders (and wherever else you sell) quickly and easily using ShipStation, the #1 choice for online retailers. Try it free for 30 days today! Take payments on your WooCommerce store via PayFast (redirect method). MailChimp for WooCommerce is a free plugin that connects your WooCommerce store with your MailChimp account. Accept PayPal, credit cards and debit cards with a single payment gateway solution — PayPal Powered by Braintree.